PresidentRam Nath Kovind Friday said false impressions were being created and spread about Yoga that it pertains to only a few people or a specific community. 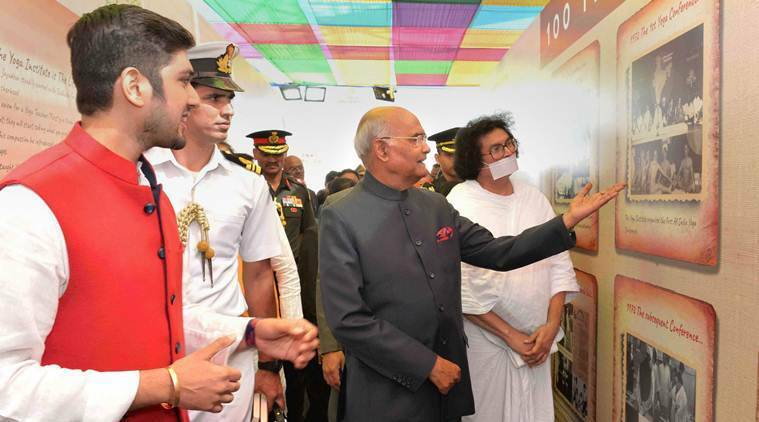 President Ram Nath Kovind Friday said false impressions were being created and spread about Yoga that it pertains to only a few people or a specific community. The President, who was in the metropolis to deliver the keynote address at an event organised to celebrate the centenary of the Yoga Institute, added that Yoga belongs to all and binds everyone. “False impression are being created and spread about Yoga that it pertains to only few people or a specific community. But this is not the truth. Yoga is a way to make body, mind and soul healthy and this binds everyone,” he said. Kovind said that going for morning walks was also a part of Yoga and doing it regularly prevents illnesses as it enriches one’s immunity. “Yoga is the best way to cure high blood pressure, hypertension, asthma etc if someone does it regularly,” he said. Kovind hailed Yoga Institute’s contribution in keeping scores of people healthy by popularising Yoga all over the world. “I have been told that the Yoga Institute has devised a new aasan (posture) to cure spine problems among truck drivers caused by sitting for hours at the steering wheel. This aasan’s name is truckaasan,” he said. Kovind also told the gathering about his interaction with the President of Cuba on the topic of Yoga. “Cuba is a Communist country and people in Communist countries do not see Yoga favourably. However, the (Cuban) President and the the First Lady told me how both had become staunch followers of Yoga and were practising it diligently,” Kovind said. Among those present for Friday’s event were Maharashtra GovernorC Vidyasagar Rao,state Chief Minister Devendra Fadnavis, Union AYUSH Minister Shripad Naik and spiritual leader Swami Chidanand. Addressing the gathering, Fadnavis lauded the institute for playing an outstanding role in spreading Yoga, adding that the ancient practice had the power to erase differences between individuals and nature as well as fight problems caused by modern day lifestyle. He also sought advice from the institute on how his government could popularise Yoga among all sections of society. The institute’s director, Dr Hansa J Yogendra, said it would continue its efforts to popularise Yoga across every section of society. The Yoga Institute, established in 1918 by Yogendra ji, is holding a two-day concluding function here, on December 28-29, of its year-long centenary celebrations. The year-long celebrations were inaugurated in December last year by Vice President Venkaiah Naidu. TheYoga Institutewas earlier this year selected for the prime minister’s award for outstanding contribution to the promotion and development of Yoga. It has produced more than 50,000 Yoga teachers and has over 500 publications to its credit.